SPECIAL OFFER! $0.99 DOMAIN NAME! Applies to the first year only of new or transfer registrations. 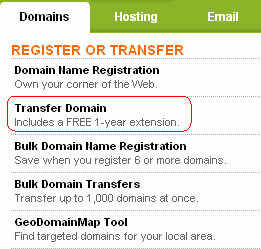 This offer may not be used for renewals, bulk registrations, premium domains or Sunrise/Landrush domain registrations. Limited to one order per customer, expiring after 10,000 redemptions or on October 5, 2010 (whichever comes first). Discount will be reflected in your shopping cart; cannot be used in conjunction with any other offer or promotion. Customers may not use gift cards, PayPal® or AliPay to redeem this offer.